I got an interesting technology request the other day from a reader. She’s trying to do more things herself, whether it’s growing or preserving or just looking at lifestyle choices. Considering that many people reading this blog are on a similar path, I must mention that where she is making this quest is a little different: it’s in a now-peaceful, war-ravaged country, and she’s not completely at home in the language. She doesn’t have the liberty of being able to choose which big-box store to shop in for her greenhouse plastic or her canning jars or gardening equipment. She can’t just go to the local library to read up on these things. And simply ordering goods over the internet is not exactly something one can do in a not-fully-operational state. Even considering her circumstances, though, there are many parallels we can draw to our own quests: sometimes it’s money that’s the limit, sometimes it’s time, sometimes, it’s know-how. But always, we should consider what’s appropriate. The great equalizer, thankfully, is the internet! So much information found “out there,” some of dubious value certainly, but if you have your own bullsh*t-o-meter pretty highly tuned, you can find some gems. What I recommended to her is that she’s got the great good fortune to be living in an area that’s not as cold as Michigan (!) so there is a lot open to her, greenery-wise. You don’t need a lot of technology to grow your own food: a hoe, a shovel, maybe a garden fork and a decent hand tool can be found in any corner of the globe. Seeds are cheap. And compost happens everywhere….even north of the arctic circle. So grow more of your own, and try to grow it year-round. Build your own cold frame or greenhouse to extend the season. Use scraps! There’s no shame at all in recycling; you’re making a better environmental choice by reusing what you can find. My first cold frame was a transparent plastic sweater box, frankly, the first winter I lived here: that’s where I sprouted my first salads and hardened off my tomato plants. And you don’t need to can things if you can try to figure out a way of growing year-round. Swear off tomatoes for half a year if you have no way of preserving them, but…drying the small ones is something most people can do in their ovens or on the roofs of their buildings in the summer sun. Pickling, lacto-fermenting, and salt-curing are other methods of preserving one’s harvest. As is a root cellar: that could simply be a box in your basement or garage, it doesn’t need to be a proper cellar. I think so much of this…whatever it is I am doing (homesteading? DIY?) is simply a mindshift. I could not duplicate what I was eating before, so I switched our diet. (I can no longer walk to get sushi, for example, or a cappuccino, or that delivered-to-my-door CSA, or get Thai food delivered; but I can get fresh eggs and fruit and garden produce.) It’s not the same; it’s different. And it takes longer, and I have less time. (I am a parent now too so I’m dividing that time pie into pretty thin slices, come to think of it.) But I am far happier for learning these new skills, for choosing to live this life, financial challenges, failed harvests, blisters and all. The only thing I had to buy was the hook and eye to keep the head gate locked. This was her maiden voyage so I hadn’t set the eye yet. Appropriate technology: no milking machine, just me and a bucket and a milk stand. Oh and a goat! This entry was posted in dairy goats, sweat. Bookmark the permalink. excellent job on the milk stand! It’s funny, I was just writing about using scrap material to build a chicken coop over on my blog. And I was bitching about the messy scrap pile – but of course, it’s useful to have scrap material around and it would be terribly wasteful to burn it or throw it away. Looks good! It really is about growing where you are planted, though that sounds really corny now that I write it. I think so much in our culture we are told we have to have exactly the right materials and/or tools (ie: products you have to purchase) to do things the “right way”. Think Martha Stewart or This Old House. But if you wait until you have the perfect location, climate, materials, time, or whatever, things will never happen! Best to just do, and make do. Love the milk stand! Milking and doing barn chores are my absolute favorite times of day…I find it quite theraputic!! We milked by hand until last year when we bought our first machine…I sort of miss the hand milking, but as I mentioned today on my blog, I now am quite certain that a milk machine is the second best invention to a hay elevator!!! Especially when used for a cow. Anyways, please excuse my ramblings…just 3 weeks ’til she’s due and I’m looking forward to seeing what she has! I think the hard part is to start. It seems to me that it is important to remember everyone has to start somewhere. People like you do really neat inspiring things, but we all can’t be where you are in just a year. It is all about starting with what you have, and the rest will follow. If it is just some tomatoes, radishes and carrots the first year, then thats ok too. I just wanted to thank you for listing the other resources for information. I read your blog and jackie clays and find both to be very interesting and plan to slowly incorporate many of the ideas into our families lifestyle. thanks again for all the real down to earth info. a hoe, a shovel, maybe a garden fork and a decent hand tool can be found in any corner of the globe. Seeds are cheap. unless they come with (local) knowledge about weather, varieties to grow, how to put food by, pests and diseases it can take years for growing to become worthwhile. It’s one thing for us relatively affluent people to try and perhaps fail when a store is close by. If my family’s survival depended wholly on what I grew I would distribute my resources (time, space, effort, money) very carefully. I’m not disagreeing with what you said just adding my 2 cents. love the recycled milking stand! 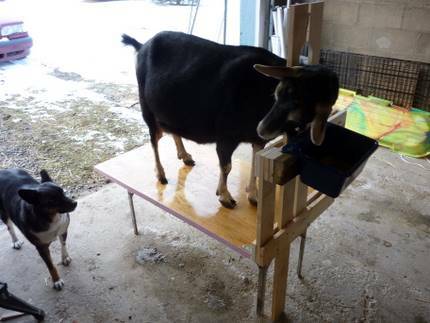 What a great milking stand, how does she get up there? I think that people sometimes forget how really good we have it in this country. I know that I catch myself taking things for granted all the time and sometimes have to stop and remind myself how very lucky I am. Thank you, this post was another good reminder. I need a “like” button to click on! 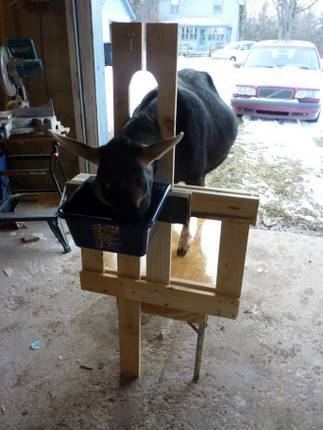 Love the milk stand… I haven’t had goats in so long, I miss them! Cool pictures! Love it. And appreciate you and your writing big time! Aimee I guess the lesson for you and me is “scrap happens.” And: isn’t it fun sometimes to repurpose things? At least Homero LIKES to pound nails. Sara, I think I have a post about using a dibber to plant my onion plants: normally I use a pointy stick, but this time I went all permanent and use a 1′ piece of rebar. Indeed, it certainly is the consumerist mantra of being an expert only if you have the correct tools. Makes me kind of mad, because it hinders people from actually accomplishing anything. Hi Jenna! Of COURSE I don’t mind your lurking, goodness! It makes me think I might need to clean up my language though 😉 because sometimes I veer off into PG-13 territory. So, does Twist have the same buck for her babies that Twix does? Her due date is the same so I kind of figured! Allegro is one BIG guy, and what a pedigree. Here’s hoping for lots of little doelings all around! And: congratulations on that calf, how fun for you all. Ashley, exactly: even *I* couldn’t be where I am in a year, it took me a long time to get here. But this all starts with the first step or three. And then one’s confidence (or in my case hubris) builds and it becomes: what CAN’T I do, which is not necessarily a problem so much as…something will need to give. It’s rewarding in many ways. Michele, you are quite welcome. I help run a program at our daughter’s school about food and use Slow Food as a model, which is good because I continually stress the “slow”! We don’t need to change the world overnight, just our habits over a few years. et, no, you’re right, and what you brought up makes writing blog posts very hard. It takes a lot of work to write these things carefully, trying to convey the most amount of information in the fewest inoffensive words. Hardly anyone in the first world is out there trying to provide everything for their families, and I would quibble that even doing the littlest planting with complete ignorance of pests, predation and local conditions can still be a rewarding experience, and one with an edible payoff. But what you mentioned, the great “why bother” when we have stores full of food, is the biggest flipping hurdle we need to get over, the mindset most obstinate and most in need of change. Those stores might not always be there, or always affordable: what then? Thanks, Serina! Don’t you love the pink trim? Mike, even terribly pregnant goats are highly motivated to get food. (Actually, goats are very good at jumping, as they’re originally mountain creatures!) I think everyone takes lots of things for granted, even people like you who rely on your own strength to heat your house and gather your own food. Sometimes, though, it’s good to simply be thankful. Esperanza, I go back and forth about finding a new zoomier template for the blog with star buttons etc. but it’s fighting with my notion that I like things super simple (no badges, few links, etc.) so…there you go. Ludditeville. Hiya DGG! I am envying your jasmine at the moment: entirely too much white stuff out there for anything flowering, except maybe an indoor orchid or three. But thanks, goats are mighty fun. Milkweed, thanks…and back at you. Actually, we bred our does to 4 different bucks, and Twist is not bred to Allegro;) We’ve got 3 due on the same day as Twix, so I think we’ll both be doing the same thing lol! My first is due in 9 days…and I’m totally looking forward to the kidding season! Yay!! hey great job recycling for the milk stand. nice preggers goat. I am watching her picture and think the table top might be a little slippery when wet with missed milk shots or water or whatever. You might want to sand down the gloss or add something for traction so she doesn’t slip off..I have had that happen before with plain wood that wasn’t varnished. Shelly, thanks for the head’s up! The milk shed is directly adjacent from her pen so it’s pretty doubtful that it’ll get too wet…and she doesn’t need to run for it either, just stepping up; I had considered it but opted for the varnished table top because it’s what I had AND it would be easy to wipe down. Thanks, though! Aye, it is always a bummer when we get to the end of the summer’s fresh tomatoes, usually sometime in January, and then the end of the canned ones. We can a lot in stews, chili and tomato sauce for spaghetti. Spring is a long wait while the snows are still receding until we get new foods growing. The big bummer is this year our tomato, potato and pumpkin crops were a complete failure. It reminds me of the stories about the potato famine and such that caused migrations. Beets, beets, beets as the song goes. And turnips, mangels. And lots of cole crops. The broccoli did very well. It is a good reminder of how important it is to have diversity. When the weather is awful from one crop it may be ideal for another. Disease that affect one leave another untouched. The pastures with their grasses, alfalfa, clover and other legumes were in excellent shape so the livestock all did well. By the way, if you want to see a pig with purple lip stick, check out those who’ve just eaten beets. They also make purple pee when grazing the beet patches which results in purple snow – we save the majority of the beets for winter fodder. Hah! Well, that makes a lot of sense, especially since the beets have the same aftereffects on us 😉 I often think about food from places of more northerly latitudes than me (at 42N) like, well, Vermont or Moscow or Oslo…or Galway…and it is root crops as far as the eye can see. Or the stomach eat. And what a good thing, too: beets especially are so packed with good stuff, and you won’t starve if you have enough potatoes. I have a bunch of mangel seeds just waiting for spring to feed our goat(s) though in truth even my *usual* beets will get football-sized with enough time. Diversity is indeed key to having a decent harvest in any one year…and what it means is lots of tomatoes one year, lots of turnips another. Here’s wishing for a *normal* year for us, Walter, so we have a lot of everything!